I'm thrilled to have my story, "Fiddleheads," included in the upcoming horror anthology, Group Hex 2, which, as the number implies, is the second such volume containing stories from members of the Ontario chapter of HWA (Horror Writers of America). I also had a story ("By Her Hand, She Draws You Down") in volume 1, so it's great to be in the second volume as well. 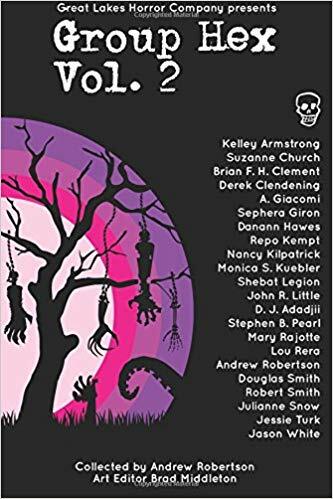 Volume 2 again has an excellent lineup of authors, with a mix of best-sellers, cult faves, and impressive newcomers: Kelley Armstrong, Suzanne Church, Brian Clement, Derek Clendening, Alessia Giacomi, Sephera Giron, Danann Hawes, Repo Kempt, Nancy Kilpatrick, Monica S. Kuebler, Shebat Legion, John R. Little, Stephen B. Pearl, Mary Rajotte, Lou Rera, Andrew Robertson, Douglas Smith, Robert Smith, Julianne Snow, Jessie Turk, and Jason White. Collected by Andrew Robertson. Art editor Brad Middleton. The book will be released with an official launch on October 26, suitably just before Halloween, at the Glad Day Bookshop at 499 Church St. in Toronto, starting at 7:30pm. After release, it will be available on Amazon for Kindle, with other retailers to follow for both print and ebook editions.